Last week we traveled to the Chicago area to buy glass. 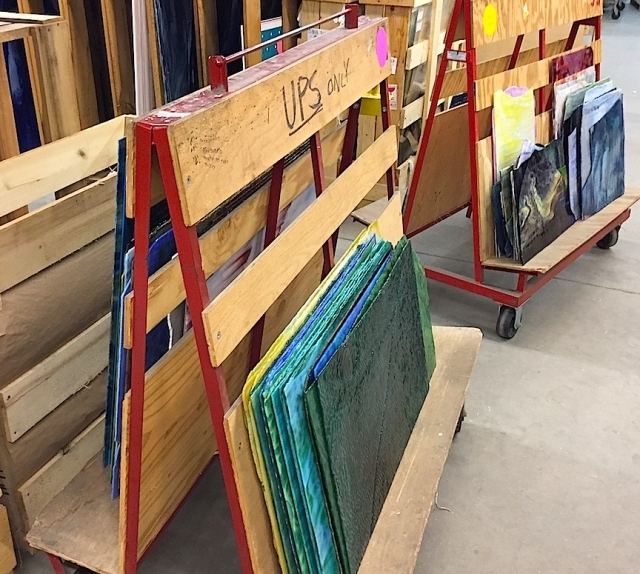 Our wholesaler has a wide selection of hand rolled art glass by all the major manufacturers to choose from, and we were able to pick many choice sheets to add to our in-studio library of glass. On a glass buying trip, we typically select one cart full (both sides) to be packed and shipped back to the studio, but on this trip we found many exceptional offerings and selected twice as many pieces as we typically acquire. 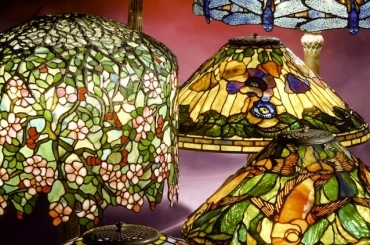 Each sheet of glass is hand selected by Irwin Terry and Bill Campbell. The sheets are carefully removed from their bins, walked to a light box to be viewed, and are then either added to the cart or returned to the proper bin. This process is time consuming and exciting, as well as being mentally and physically exhausting.The glass has been crated and is on its way to the studio.